City MA Newspaper Journalism student wins bursary sponsored by The Tab. 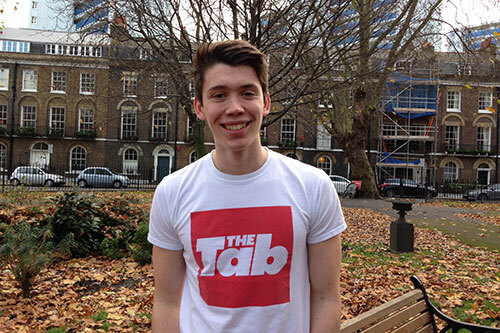 Sam Dean, student on the City University London MA Newspaper Journalism course, has been awarded an exclusive bursary sponsored by popular student news site, The Tab. Sam was selected for the award by a committee made up of Professor George Brock, Head of Journalism at City University London, Jack Rivlin, Editor-in-Chief of The Tab and a working journalist independent of both The Tab and City. After submitting five articles to the committee earlier this year, he was selected from numerous other applicants to receive the funding. Sam is delighted to have been picked as the successful candidate: "The Tab bursary has been a massive financial help for me - it allowed me to study journalism at the most prestigious course in the country and I may not have been able to come here without it." "I was completely shocked to receive the bursary and, to be honest, I still can't believe I was the lucky one." He added, "Like every student on here, I'm looking to find a top job as a journalist on leaving the course, and hopefully the skills learnt here and at The Tab will set me in good stead for that."